Here is a well set-up laundry room. There are three high-speed, 300 g-force W5280X machines. They are capable of AWS (Automatic Water Savings) which weighs the load calls for variable amounts of water. For dryers they have three T5675, 83 lb. capacity dryers. Note the fancy tile on the front of the pad. Not a bit of it was chipped on install. Last, these are stainless machines. The front, protective stickers have yet to be peeled. We'll wait until construction is over. Detail of W5280X with programmable port on the left and Compass Control knob on right. Bay of T5675 reversing dryers. The fur-down on top has yet to be added. Despite being in the basement and having one inch clearance on a freight elevator we got this 120 lb. Milnor dryer installed before lunch. That's a half-day of the dryer being down for a changeover. Not bad. Old 120 lb. dryer on right coming out. This dryer comes in two pieces and the top control unit has already been removed and is on the floor in the bottom right of the pic. Here is Andre (second from right) and his engineering crew standing in front of their new Milnor 120 lb. dryer. A good looking set of washers and dryers for a new Springhill Suites. The soft-mount, "H", 450 g-force washers help make up a bunch of capacity for the small pad the architect gave them. Two W5240H high speed washers. Monte Potts and Ken Knodel teamed up for this new installation in NE Oklahoma. The generous pad made installation easy. 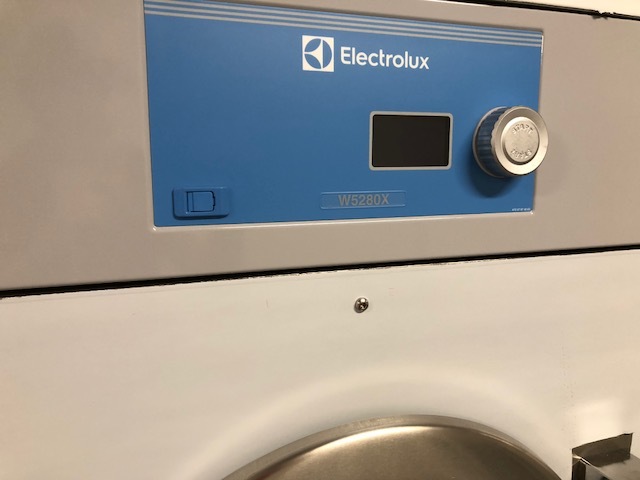 The space between the washers can be used to store chemicals. Another new install for a new hotel. These soft-mount EX washers can go up to 300 g-force. The extra water extraction helps reduce load on the dryers and shorten cycle time. They also have better programming including Smart Dosing and Automatic Water Savings. Nice tight enclosure for the T5675 dryers. You can also see a well done pad with trough drain on the left. The washers are stainless steel fronts. The stickers have been left on during final construction. Arrow did a new hotel laundry room in southeast Oklahoma. Two T5675 83 lb dryers and two W5280X 65 lb washers. The washers are 300 g-force to help extract more water before drying.